BAA Training is heading towards new markets for pilot training business development. 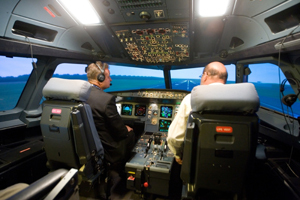 After successful audit completion of Civil Aviation Administration of China (CAAC), the Flight Simulation Device Certificate has been issued of Airbus A320 Full Flight Simulator. The BAA Training management is glad that the equipment of the training centre is sufficient to serve Chinese airlines. ‘Being approved by the CAAC BAA Training is enabled to enter the China’s market as the reliable aviation training provider. We are very keen to start business development in this market and hopefully be a part of pilot shortage problem solution,’ commented Egle Vaitkeviciute, the CEO at BAA Training. According to CAAC data, in 2010 there were 24,000 pilots in China. The CAAC forecasts show that by the year 2015 the numbers should reach 40,000. This substantial growth confirms that an average of 3,200 new pilots is needed every year, however at the moment; existing flight training schools are only producing 2,000 new pilots a year. BAA Training seeks to facilitate the new students and help to eliminate the shortage of professional pilots China is facing.